Reuters has a report on Denmark's plans to switch to renewable energy - Denmark aims for 100 percent renewable energy in 2050. The portion of Denmark's electricity from wind and other renewables would rise to 52 percent by 2020 under the new plan, topping a 50 percent target in a government policy program adopted last month. Despite Denmark's green credentials in wind energy, the country has virtually no hydropower and no nuclear installations, making it still heavily dependent on coal. In 2010, coal accounted for nearly 44 percent of total Danish power generation and fossil fuels altogether for two thirds, while renewables accounted for one third. The government's proposal called for coal-fired power plants and oil-fired heating to be phased out by 2030. Coal heating, which now accounts for 11 percent of the total heat supply, would be replaced by biomass. Forbes reports that solar thermal power developer Brightsource is looking to exploit CSP's primary advantage over solar PV - the ability to store anergy for dispatchable generation - BrightSource Strikes World's Biggest Solar Energy Storage Deal. BrightSource Energy said Monday that it has struck a deal to add energy storage systems to three massive solar thermal power plants it will build to supply electricity to utility Southern California Edison. Energy storage will allow the plants to operate into the night, meaning that BrightSource can now forgo building one 200-megawatt solar station that previously was needed to meet its obligation to generate 4 million megawatt-hours of electricity annually for the utility. BrightSource spokesman Keely Wachs said in an e-mail that only six of the seven planned solar “power tower” stations will need to be built, saving some 1,280 acres of desert land. If approved by state regulators, the amended contracts with Southern California Edison will also result in lower costs for utility customers, the company said. Both issues have come to the forefront as some environmentalists increasingly object to industrializing swaths of California’s Mojave Desert for solar power plants. Solar thermal developers, meanwhile, compete against ever-cheaper photovoltaic power plants as the price of solar modules continues to fall. When four of the nine big solar thermal power plants approved by the California Energy Commission last year changed ownership, the new developers announced they would switch to solar panels like those found on residential rooftops and which convert sunlight directly into electricity. Bloginity has a look at an exhibition about the life and works of Bucky Fuller - The Utopian Impulse: Buckminster Fuller and the Bay Area. The Bay Area attracts dreamers, progressives, nonconformists, and designers. Buckminster Fuller was all of these, and though he never lived in San Francisco, his ideas spawned many local experiments in the realms of technology, engineering, and sustainability—some more successful than others. The Whole Earth Catalog, Apple, The North Face, and Governor Jerry Brown have all cited Fuller as a key influence on several projects. From March 31 through July 29, 2012, the San Francisco Museum of Modern Art (SFMOMA) will present The Utopian Impulse: Buckminster Fuller and the Bay Area, the first exhibition to consider Fuller’s local design legacy. The presentation will feature some 65 works, including prints, drawings, photographs, documentary video, books, models, and ephemera representing some of Fuller’s most iconic projects alongside those by Bay Area designers inspired by his oeuvre. The Utopian Impulse opens by introducing Fuller, primarily with prints from the Inventions: Twelve Around One portfolio (1981), as well as several key works on loan from the R. Buckminster Fuller Archive at Stanford University. Pairing the artist’s own drawings of projects dating from the late 1920s through the mid-1970s with iconic imagery of built work, the portfolio commemorates his most well-known ideas, such as the 4D House (1928), a hexagonal autonomous dwelling meant to be optimally resource efficient and mass producible from factory-made kits that could be easily shipped anywhere and quickly assembled on site. Extending this optimization to transportation, Fuller’s ultra-light three-wheeled Dymaxion Car (1933) featured unprecedented fuel efficiency and an aerodynamic, teardrop shape, which was determined in collaboration with his friend, designer Isamu Noguchi. While these projects held promise in efficiency in the name of societal good, each was rife with design problems that proved too difficult to solve. Fuller strove for the Fordist dream of improving society through mass production, which inherently conflicted with his “more with less” philosophy promoting self-reliance, sustainability, and low ecological impact. Perhaps overambitious about his abilities to bypass business and societal norms, ultimately Fuller was not able to earn both financial and critical success for his designs, so he lectured tirelessly around the globe to survive. “While his appeal to the government and to the counterculture movement was broad, he still never quite fit in,” says Fletcher. “Perhaps it was frustrating for him or maybe it was a calculated elusiveness. Either way, the view of Fuller as an outsider has emerged as an emblem for ‘thinking differently,’ which is a starting point for many Bay Area initiatives." The NYT has a look at manouevrings in the South China Sea and elsewhere looking to control offshore oil developments - A New Era of Gunboat Diplomacy. IT may seem strange in an era of cyberwarfare and drone attacks, but the newest front in the rivalry between the United States and China is a tropical sea, where the drive to tap rich offshore oil and gas reserves has set off a conflict akin to the gunboat diplomacy of the 19th century. The Obama administration first waded into the treacherous waters of the South China Sea last year when Secretary of State Hillary Rodham Clinton declared, at a tense meeting of Asian countries in Hanoi, that the United States would join Vietnam, the Philippines and other countries in resisting Beijing’s efforts to dominate the sea. China, predictably, was enraged by what it viewed as American meddling. For all its echoes of the 1800s, not to mention the cold war, the showdown in the South China Sea augurs a new type of maritime conflict — one that is playing out from the Mediterranean Sea to the Arctic Ocean, where fuel-hungry economic powers, newly accessible undersea energy riches and even changes in the earth’s climate are conspiring to create a 21st-century contest for the seas. China is not alone in its maritime ambitions. Turkey has clashed with Cyprus and stoked tensions with Greece and Israel over natural-gas fields that lie under the eastern Mediterranean. Several powers, including Russia, Canada and the United States, are eagerly circling the Arctic, where melting polar ice is opening up new shipping routes and the tantalizing possibility of vast oil and gas deposits beneath. “This hunt for resources is going to consume large bodies of water around the world for at least the next couple of decades,” Mrs. Clinton said in a recent interview, describing a global competition that sounds like a watery Great Game. Such tensions are sure to shadow President Obama this week, as he meets with leaders from China and other Asian countries in Honolulu and on the Indonesian island of Bali. Administration officials said they expected all sides to tamp down disagreements, though that won’t mask the coming conflicts. The Google blog reports that Google's RE < C program (along with various other projects like Google Wave) is no more - More spring cleaning out of season. Renewable Energy Cheaper than Coal —This initiative was developed as an effort to drive down the cost of renewable energy, with an RE < C engineering team focused on researching improvements to solar power technology. At this point, other institutions are better positioned than Google to take this research to the next level. So we’ve published our results to help others in the field continue to advance the state of power tower technology, and we’ve closed our efforts. We will continue our work to generate cleaner, more efficient energy—including our on-campus efforts, procuring renewable energy for our data centers, making our data centers even more efficient and investing more than $850 million in renewable energy technologies. CleanTechnica puts the announcement into context - Google Favoring Clean Energy Deployment over Clean Energy R&D. Announced in 2007 by Google, RE < C was focused on driving down the cost of renewable electricity (mostly solar and geothermal) to meet the cost of generating electricity from coal. The initiative funded R&D in capital-intensive, early-stage technologies that would enable cheaper Enhanced Geothermal Systems and Concentrating Solar Power projects. Over the last few years, we’ve seen a lot of progress in clean energy. We’re excited that some technologies are so quickly approaching cost competitiveness with traditional forms of energy in parts of the US and the world. Power tower technology has come a long way, too. But the installed cost of solar photovoltaic technology has declined dramatically over the past few years, making solar photovoltaic technology a compelling choice for consumers. At this point, other institutions are better positioned than Google to take this research to the next level. So we’ve published our results to help others in the field continue to advance the state of power tower technology, and we’ve closed our efforts. We will continue our work to generate cleaner, more efficient energy—including our on-campus efforts, procuring renewable energy for our data centers, making our data centers even more efficient and investing more than $850 million in renewable energy technologies. Although the news was hidden at the bottom of a blog post, this is a pretty important announcement. (Only at Google would they casually “spring clean” millions of dollars in R&D investments for renewable energy). Firstly, it shows how capital intensive many of these technologies are. Google invested tens of millions of dollars into R&D for new methods of building CSP plants. Today, we’ve got a number of commercial projects deployed using some of the technologies and methods funded by Google — but even after investing all that money, much of the research is still in the early phases, the company says. The same goes for Google’s funding of Potter Drilling, a company working on developing a technique for drilling through deep, hard rock called “thermal spallation.” The drill is designed for Enhanced Geothermal projects. Potter has been working on the technique since 2004, with Google investing over $10 million in the company through its RE < C initiative in 2008. But like most development in the EGS sector, progress has been slow and the drill has not been commercialized yet. Google’s shift away from these projects doesn’t prove whether or not they’ll be successful. It just shows how much money and time goes into bringing new energy technologies to scale. Meanwhile, the stunning changes in the economics of solar PV have made market conditions far different today than in 2007. Google has since invested more than $350 million into the deployment of distributed solar, investing in SolarCity and Clean Power Finance, and a variety of projects in Germany. (Google also threw $168 million behind the Ivahpah CSP project, showing that it still has a lot of confidence in that technology too). Crikey reports the "Climategate" non-event is being rehashed now the Durban climate conference is about to start - no story last time round, no story this time round - New Climategate emails reveal life is tough for scientists. “These folks appear to have some very large industry groups behind them running the show, setting up forums for them on capitol hill (the latest sponsored by the infamous ‘Marshall Institute’) and its best for scientists not to exchange any emails with them — they will only quote you out of context and misrepresent your comments.” — Michael Mann, Wednesday, November 12, 2003. Climate scientist Michael Mann is known for his reconstructions of past global temperatures — namely the hockey stick graph — which has withstood extreme scrutiny since it was first published in 1999. But as the email above shows, Manne is not without some skill in predicting the future. In late 2009, shortly before world leaders gathered in Copenhagen for UN climate talks, a cache of private emails originating from the University of East Anglia was released onto the internet. Climate sceptics and deniers claimed the emails showed global warming to be a hoax cooked-up by a cabal of scientists. The claims of sceptics, repeated and amplified without question by some media commentators, were examined by nine separate investigations. A legitimate criticism was that, in the face of a persistent deluge of inquiries, some scientists had occasionally sought to block Freedom of Information requests. There were legitimate concerns raised too that some scientists had sought to prevent what they considered to be faulty science from appearing in journals. But the inquiries cleared the scientists of any scientific wrongdoing despite the pant-wetting squeals of some climate sceptic commentators (Andrew Bolt called it one of the greatest scandals in modern science). Despite the fact that these inquiries showed many commentators had misled their viewers and readers, few (if any) were able to muster an apology or a retraction. In the past 48 hours, a new cache of 5439 emails and 23 documents has been released, along with a “README” file. A separate encrypted file has also been released. It isn’t known who was responsible for releasing the emails, except to say that they first appeared as links to a Russian server on some climate sceptic blogs (the link is now dead, but several mirror sites have been set up). The emails cover the same 10-year period (1999-2009) as the 2009 release and despite two years having passed, Norfolk Police — with jurisdiction over the University of East Anglia — have said little to suggest they have made any progress on their investigation. BBC environment correspondent Richard Black reported yesterday that a Freedom of Information request to Norfolk Police had indicated that since February, just £80 had been spent on the case. Only £5,649.09 had been spent this year, but Norfolk Police pointed out this only related to additional expenditure above officer and staff time. A statement from Norfolk Police last night said the Operation Cabin enquiry team had been “determined and persistent in following all relevant lines of enquiry, some of which have been international in nature”. The new release of emails and documents had “given us fresh lines of inquiry,” said Detective Superintendent Julian Gregory. The UEA has suggested these new emails were most likely held back from release by the original alleged hackers. Almost all the climate sceptic blogs, including Andrew Bolt’s and JoNova’s, have reproduced the text of the README file which cherry-picks from 85 of the 5349 emails. The anonymous author of the README file claims there are another 220,000 emails that “are encrypted for various reasons. We are not planning to publicly release the passphrase”. Early yesterday, I downloaded the entire zip file of emails and 23 documents so that I could search the text of the files myself. The purpose of the README file is obviously to draw the reader’s attention to particular emails and — in many cases — only particular parts of emails, some of which are without context. The README file omits a significant number of emails that contain scathing criticism of the “science” being distributed by so-called sceptics. The content of the emails is wide ranging. Some discuss holidays, others the technical contents of IPCC reports. There’s criticism about scientific papers published by sceptics and plenty of criticism of each other’s work. But the cache of emails also reveals (like the first 2009 release did) the difficulties that climate scientists have in going about their everyday work, particular under a constant barrage of Freedom of Information requests and public criticism. For example, in an email sent on September 8, 2009, Phil Jones indicates one reason he is reluctant to voluntarily release data to particular individuals — in this case Steve McIntyre, a Canadian mathematician, blogger and oil and gas industry man (searching for “McIntyre” in the emails returns more than 300 results, including some in 2003 where McIntyre is still using his “CGX Energy” email address). It appears this scandal, again is unfolding. The ABC has a look at the coal seam gas industry - Water, salt and carbon in the coal seam gas future. The ABC has launched Coal Seam Gas: By the Numbers, a website that maps the coal seam gas industry and explores its impact on water resources into the future. The project calculates the amount of water which will be drawn from the ground as a result of gas extraction from the coal seam, considers waste materials collected and approaches to managing that waste. ABC investigative reporters have used data and information from many sources, including environmental impact studies commissioned by mining companies at the request of Governments. Investigative reporter Wendy Carlisle says "the research shows a large number of coal seam gas leases coincide with major underground water supplies used by farmers." "What it shows is in broad terms coal seam gas will engineer a massive redirection of the water system in Australia. "Landholders and governments don't yet know the impact this will have. It is the great coal seam gas experiment." There will be as many as 40,000 gas wells in Australia in less than 20 years. The article refers to this background piece -Coal Seam Gas - By The Numbers. Coal seam gas has emerged as a major industry in Australia in little more than a decade. The scale and speed of its growth has been nothing short of astonishing: billions of dollars have poured into regional areas; new jobs have been created; state and national coffers have swelled; export contracts have been signed and sealed; massive liquefied natural gas facilities have been approved for construction at regional ports. Farmers fear they are losing control of their land. Miners and some politicians say coal seam gas offers a much greener energy choice. Environmentalists and other politicians have cast doubt on those claims. The ABC's data journalism project has pulled together information from dozens of sources to provide an insight into the promise and the dangers inherent in the coal seam gas rush. - it is estimated there will be at least 40,000 coal seam gas wells in Australia by 2030? - conservative estimates suggest coal seam gas wells could draw 300 gigalitres of water from the ground each year? - the industry could produce as much greenhouse gas as all the cars on the road in Australia? Over the next 20 years coal seam gas operations are expected to continue expanding. How much water will the CSG industry use? Australia's Great Artesian Basin and its underground aquifers are a vital source of water; farmers and other bore users are given allocations for their use. By 2014, the Commonwealth will have spent nearly $150 million under the Great Artesian Basin Sustainability Initiative, capping bores and fixing pipes to conserve water. The coal seam gas industry is entitled to remove massive amounts of water from groundwater systems. - a 0.2 of a metre drop in the water table surrounding naturally occurring springs, creeks and rivers. The make-good arrangements have not yet been fully spelt out by government. In addition to these provisions, the forthcoming Murray Basin Plan will set limits on groundwater extraction, including by the CSG industry. The states must enact these limits by 2019. There is a fierce debate about the amount of water the coal seam gas industry will extract from underground, and what impact it may have on the sustainability of the Great Artesian Basin. The industry suggests it will pull out somewhere between 126 gigalitres and 280 gigalitres a year, while the National Water Commission puts the figure above 300 gigalitres a year. Others, including the Water Group advising the Federal Government, suggest it is higher still. Forbes has a post on some of Hot Dry Rocks' marketing for Australian geothermal energy - Australia Could Be A Geothermal Powerhouse. Last week, geothermal consulting company Hot Dry Rocks released a geothermal map of Australia that shows the country’s incredible potential for tapping its geothermal energy supplies. The map, which was developed in conjunction with Google.org, shows that if Australia were to only use 2% of its geothermal potential using today’s technology, it could produce 395,092 MW – about ten times more than Australia’s total coal and gas production. One of a major benefits for using geothermal energy in Australia is that, as you can see from the map above, it’s generally available everywhere. Australia has some of the highest temperatures in its known near-surface rocks anywhere in the world and its geothermal potential is distributed over the entire country. The Canberra Times has a similar post focusing on potential in the ACT - Thermal might one day power the capital. The ACT could one day generate its own power with up to 430 megawatts of renewable geothermal energy, according to new data issued today. Australian geothermal energy consultancy Hot Dry Rocks has released figures showing that the rocks up to 5km beneath Australia's surface store enough heat to theoretically provide 85 million megawatts, equivalent to the country's current energy needs for the next 50,000 years. In the ACT, 430 megawatts could be produced by extracting 20 per cent of the estimated heat energy over the next 30 years. The Climate Spectator has a rather more detailed take on the story - Can geothermal cut it in Australia?. In the geothermal industry, they are fond of painting the big picture. For years, the selling point of the technology was that if just 1 per cent of the superheated rocks that lay deep under the surface in Australia could be exploited, then it could power the country for 26,000 years. That estimate was based on the assumption that the industry could extract every last drop of heat, which of course would never happen. It’s like solar’s claim that the sun could power Australia’s needs 10,000 times over if all its radiation could be harnessed, or coal that it could continue to power the world for another 250 years. It’s either technically not feasible, or not particularly desirable. The latest geothermal industry estimates – a collaboration between consulting group Hot Dry Rocks and Google – try to inject a little more reality to the forecasts, but it is still comes up with a considerable number: if just 2 per cent of Australia’s technically-accessible hot dry rock potential is tapped, this would generate capacity of 395,092 MW of clean, emissions-free, renewable electricity, or almost 10 times that of the current capacity of carbon-emitting coal and gas. That still sounds like it is more than enough, but can it be achieved? Governments have set great store by it. In some policy scenarios, geothermal makes up 20 per cent of Australia’s capacity by 2050, and the US has predicted it meeting 5 per cent of its needs. While numbers and estimates flow freely from the geothermal industry, they are yet to convince investors that its heat can too. As one executive described it, geothermal like a mis-firing sporting team, it has managed to gather the required elements without finding a way of putting them together. How it does that is one of the focal points of the industry’s annual conference in Melbourne this week. You wouldn't know it from the languishing share prices of Australian geothermal aspirants – which has turned all but a notable few into the status of penny dreadfuls – but the global geothermal industry has been experiencing something of a boom these past five years. Its global capacity has grown to 10,500MW, and it expects this to occur again in the next five years. (Australia’s capacity is less than 0.5MW). But while conventional hydrothermal projects in volcanic regions account for three quarters of these developments, there are no new volcanoes and hot springs to discover. The industry’s future growth lies in its ability to push the technology frontier on what are known as “enhanced geothermal systems” or EGS, hot rocks that lie deeper beneath the earth and which need considerable more encouragement to release their energy towards the earths’ surface than a New Zealand geyser. Australia has been at the forefront of this experimental technology in the past five years, but according to Graeme Beardsmore, the head of Hot Dry Rocks, the setbacks experienced by Geodynamics with the blow-out of its Habanero well, and assorted delays elsewhere, may have pushed the industry back by three years. Terry Kallis, the head of Petratherm, one of the most advanced of the geothermal aspirants, and a former chairman of the Australian Geothermal Association, agrees that the industry is caught in a Catch-22 situation. “We need to show results,” he said. Petratherm, along with Geodynamics, is nearest of all, and both hope to be producing electrons from pilot projects within 18 months. But the industry needs more than just these two projects to prove its worth. The HDR-Google collaboration shows that although most geothermal drilling and development is taking place in South Australia, the largest heat resources for EGS lie in Queensland and the Northern Territory. Working on its formula of extracting 2 per cent of resources of up to 300°C available at depths higher than 5000 metres, the study estimates there is 136,759MW of potential capacity in Queensland and 83,104MW in the territory. This compares to 58,541MW in SA, 55,133MW in NSW, 46,080 in WA, 12,411MW in Victoria, and 43MW in the ACT. Tasmania has an estimated 3,021MW of capacity. Climate change episode of Frozen Planet won't be shown in the U.S.
An episode of the BBC's Frozen Planet documentary series that looks at climate change has been scrapped in the U.S., where many are hostile to the idea of global warming. British viewers will see all seven episodes of the multi-million-pound nature series throughout the Autumn. But U.S. audiences will not be shown the last episode, which looks at the threat posed by man to the natural world. It is feared a show that preaches global warming could upset viewers in the U.S., where around half of people do not believe in climate change. Stuart at Early Warning has an update on Saudi oil production - Saudi Oil Production Declining. Saudi oil production has been declining modestly for the last 2-3 months (depending on your preferred data source) while the oil rig count in country has continued to increase. See above graph (the black line is the average of five sources of production information on the left scale, while the red curve in the lower part of the graph is the Baker Hughes rig count on the right scale). For readers that don't follow every twist and turn of Saudi oil statistics let me sketch the back story since 2005. In about 2005 when global oil supply appeared to plateau, Saudi Arabia also had appeared to plateau at around 9.5mbd. At that time the rig count, having been stable for years, began to rise as Saudi Arabia launched a series of large megaprojects to expand production capacity (or replace oilfields that were in decline depending on your point of view). 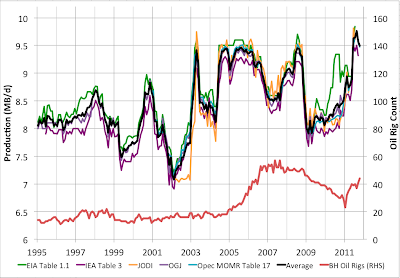 Then in 2006, production began to mysteriously decline despite high oil prices (provoking a great deal of debate in the energy blogosphere as to whether this was a voluntary move to further increase prices, or an involuntary one due to underinvestment and/or declines in some of their fields). Regardless, in mid 2007, production began to gradually increase again until by mid 2008 it had reached the previous plateau level of 9.5mbd. With the financial crisis of 2008, oil prices dropped below $40/barrel and the Saudis, in co-ordination with other OPEC countries, made a moderate but sharp cut in production down to about 8mbd to protect prices. Then in 2009 and more so in 2010 they began to gradually increase production as the global economy improved and prices got higher. This culminated in a brief hiatus just below 9mbd around January 2011. Indeed as the world lost Libyan production in January/February of this year, Saudia Arabia initially did nothing. However, a few months later there was an agreement with the IEA such that the OECD countries would release oil from government strategic reserves for 30 days while the Saudis ramped up to a level of 10mbd. Saudi Arabia did then increase oil production sharply in June to a peak of around 9.7 mbd or 9.8mbd - not quite achieving the promised 10mbd. They have not then gone on either to increase up to 10mbd or to maintain production at the peak level, but rather have eased back to about 9.5mbd. So are we any the wiser as to the great question of whether Saudi Arabia has significant spare capacity and could increase production to 12mbd or more if only they chose? Only slightly I fear. I interpret the fact that the Saudi's couldn't quite meet the 10mbd promise and almost immediately backed off that, despite amply high prices, as consistent with the story that the recent Saudi production expansions have only gone to offset declines elsewhere (perhaps especially in north Ghawar). The increasing rig count also suggests a lack of comfort with the amount of spare capacity presently available. However, I can see that someone who thought the Saudis were able to produce more but are profit maximizers who intend to keep prices as high as possible consistent with not actually throwing the world economy into recession might also be able to tell a story about how the Saudis did the bare minimum to moderate prices after it became clear that the Libya price spike was causing global economic harm but then began gradually lowering production as prices slowly began to fall following the price spike, keeping the world in a state of slow growth, but some growth, while maximizing the Saudi take for its oil. The one weak point in this story is that it offers no explanation for the rising rig count. The FT reports that the Saudis are claiming the market is well supplied and they don't need to expand production - Saudi Arabia halts $100bn oil expansion programme. Saudi Arabia has halted the $100bn expansion of its oil production capacity after reaching a target of 12m barrels a day as the kingdom believes that new oil sources will meet raising demand. Khalid al-Falih, chief executive of state-owned Saudi Aramco, said on Monday that pressure on Riyadh to raise its output capacity had “substantially reduced”, the clearest indication yet that the world’s top oil producer is not pushing ahead with an assumed expansion plan to 15m b/d by the end of 2020. Technology Review has a look at new advances in solar oanel production which should hopefully push prices down further - Advance Could Challenge China's Solar Dominance. Chinese solar-panel manufacturers dominate the industry, but a new way of making an exotic type of crystalline silicon might benefit solar companies outside of China that have designs that take advantage of the material. GT Advanced Technologies, one of world's biggest suppliers of furnaces for turning silicon into large crystalline cubes that can then be sliced to make wafers for solar cells, recently announced two advanced technologies for making crystalline silicon. The new approaches significantly lower the cost of making high-end crystalline silicon for highly efficient solar cells. The first technology, which GT calls Monocast, can be applied as a retrofit to existing furnaces, making it possible to produce monocrystalline silicon using the same equipment now used to make lower quality multicrystalline silicon. It will be available early next year. Several other manufacturers are developing similar technology. It's the second technology, which the company calls HiCz, that could have a bigger long-term impact. It cuts the cost of making a type of monocrystalline silicon that is leavened with trace amounts of phosphorous, which further boosts a panel's efficiency. This type of silicon is currently used in only 10 percent of solar panels because of its high cost, but could gain a bigger share of the market as a result of the cost savings (up to 40 percent) from GT's technology. The technology will be available next year. A standard solar panel, made of multicrystalline silicon, might generate 230 watts in full sunlight. A panel the same size made of monocrystalline silicon could generate 245 watts. But phosphorous-doped monocrystalline silicon (also called n-type monocrystalline) enables a type of solar panel that generates 320 watts, a huge leap in performance. The video I linked to on the weekend had spread widely as the week opened - Crikey's Bernard Keane had this to say - Occupy crackdowns perfectly illustrate the movement’s claims. It’s the casualness of it, the apparent insouciance of the act, that catches attention the most. University of California policeman John Pike strolls in front of a group of seated Occupy protestors and bombards them with pepper spray like he’s using insecticide. The casualness, and the contrast — between the heavily-equipped, helmeted officer and his passive targets. In a few seconds, Pike earned himself the sort of international notoriety reserved for southern sheriffs from the 1960s, another victim of the reversal of the panopticon, in which law enforcement are now the subject of ever-increasing surveillance, especially as protests are attended by a bank of cameras, phones and the occasional iPad recording everything. It also replaced as an iconic image that of Dorli Rainey, who the previous night had, if only temporarily, provided the compelling image of the protests after she was pepper-sprayed by police in Seattle. They were only the latest of a series of incidents involving police-on-protester attacks during Occupy protests, the most notorious being the Oakland shooting with a “non-lethal weapon” of Scott Olsen that put the Iraq veteran into a coma. The police tactics had their counterpart here with the violent eviction of Melbourne protesters on October 21. In all cases, police tactics appear designed around responding to violent riots, rather than peaceful protest or passive resistance. But as Pike — since placed on leave-with-pay — may now understand, that has the potential to generate the sorts of appalling contrasts for which he will forever be associated. There’s some important context here, of course: protests in Tahrir Square in Cairo over the last 40 hours have now left at least five, and probably more, dead (there are currently reports of up to 27 fatalities). There’s a tendency to glib equation of the Occupy protests with the Arab Spring, which overlooks not merely that the reaction of law enforcement to the protests in western countries hasn’t yet yielded a body count, but that even non-violent protesters in less dangerous Middle Eastern countries often risk their lives. For a movement that has been persistently criticised for failing to articulate any sort of positive agenda, however, the images of police overreaction are enormously beneficial, not merely for cynical reason that they generate media coverage, but because they provide an effective illustration of what the movement is complaining about, a visual counterpart to the cut-through “1%” slogan. While the movement’s complaints — the debauching of democratic government by corporate interests, the economic double standards of the latter, the skewing of capitalism against the interests of most of the community — are hard to articulate in detail, the overreaction of law enforcement encapsulates the basic notion that the governmental apparatus is hostile to even passive forms of dissent and dismissive of basic rights. This is enhanced by the reaction of authorities in the aftermath of violent police crackdowns. While Seattle mayor Mike McGinn immediately apologised to Rainey, he was atypical of authorities, who have either had to reluctantly support police despite obvious misgivings about their behaviour, or have resorted to peculiar reasoning to justify actions against protesters. New York mayor Michael Bloomberg justified clearing Zucotti Park on “health and safety” grounds. Melbourne mayor Robert Doyle had a bizarre interview with Jon Faine in which Doyle dismissed the need for any independent inquiry into the violence inflicted on Occupy Melbourne protesters, or even that anything untoward may have occurred. Oakland mayor and former activist Jean Quan has tried to blame “anarchists” for violence in the crackdown in that city. They’ve been supported by some law and order commentators. “It is truly not excessive and I am surprised by how not excessive it is,” said one New York policing academic in the aftermath of violent crackdowns in the US. Not excessive in a Middle Eastern context, true. The result is a stream of images, accompanied by a stream of rhetoric, that appears to confirm exactly what the movement is saying: that governments now instinctively lash out at dissent and rely heavily on spin to protect themselves. It reinforces the cynicism of voters who have become all too aware of the credibility gap in western societies between the carefully-prepared talking points of government (and corporate) leaders and reality. The problem isn’t so much John Pike, an employee who will bear the brunt of the reaction against law enforcement tactics, as the lack of faith voters have in authorities and the way those in authority so frequently give them good reason for that lack of faith. Glenn Greenwald at Salon has his usual rather long winded look at the events - The roots of the UC-Davis pepper-spraying. (1) Despite all the rights of free speech and assembly flamboyantly guaranteed by the U.S. Constitution, the reality is that punishing the exercise of those rights with police force and state violence has been the reflexive response in America for quite some time. As Franke-Ruta put it, “America has a very long history of protests that meet with excessive or violent response, most vividly recorded in the second half of the 20th century.” Digby yesterday recounted a similar though even worse incident aimed at environmental protesters. The intent and effect of such abuse is that it renders those guaranteed freedoms meaningless. If a population becomes bullied or intimidated out of exercising rights offered on paper, those rights effectively cease to exist. Every time the citizenry watches peaceful protesters getting pepper-sprayed — or hears that an Occupy protester suffered brain damage and almost died after being shot in the skull with a rubber bullet — many become increasingly fearful of participating in this citizen movement, and also become fearful in general of exercising their rights in a way that is bothersome or threatening to those in power. That’s a natural response, and it’s exactly what the climate of fear imposed by all abusive police state actions is intended to achieve: to coerce citizens to “decide” on their own to be passive and compliant — to refrain from exercising their rights — out of fear of what will happen if they don’t. The genius of this approach is how insidious its effects are: because the rights continue to be offered on paper, the citizenry continues to believe it is free. They believe that they are free to do everything they choose to do, because they have been “persuaded” — through fear and intimidation — to passively accept the status quo. As Rosa Luxemburg so perfectly put it: “Those who do not move, do not notice their chains.” Someone who sits at home and never protests or effectively challenges power factions will not realize that their rights of speech and assembly have been effectively eroded because they never seek to exercise those rights; it’s only when we see steadfast, courageous resistance from the likes of these UC-Davis students is this erosion of rights manifest. (2) Although excessive police force has long been a reflexive response to American political protests, two developments in the post-9/11 world have exacerbated this. The first is that the U.S. Government — in the name of Terrorism — has aggressively para-militarized the nation’s domestic police forces by lavishing them with countless military-style weapons and other war-like technologies, training them in war-zone military tactics, and generally imposing a war mentality on them. Arming domestic police forces with para-military weaponry will ensure their systematic use even in the absence of a Terrorist attack on U.S. soil; they will simply find other, increasingly permissive uses for those weapons. Responding to peaceful protests and other expressions of growing citizenry unrest with brute force is a direct by-product of what we’ve allowed to be done to America’s domestic police forces in the name of the War on Terror (and, before that, in the name of the War on Drugs). The second exacerbating development is more subtle but more important: the authoritarian mentality that has been nourished in the name of Terrorism. It’s a very small step to go from supporting the abuse of defenseless detainees (including one’s fellow citizens) to supporting the pepper-spraying and tasering of non-violent political protesters. It’s an even smaller step to go from supporting the power of the President to imprison or kill anyone he wants (including one’s fellow citizens and even their teenaged children) with no transparency, checks or due process to supporting the power of the police and the authorities who command them to punish with force anyone who commits the “crime” of non-compliance. At the root of all of those views is the classic authoritarian mindset: reflexive support for authority, contempt for those who challenge them, and a blind faith in their unilateral, unchecked decisions regarding who is Bad and deserves state-issued punishment. It’s anything but surprising that a country that has cheered as its Presidents seize the most limitless powers against allegedly Bad People — all as part of the ultimate instrument of citizen degradation: Endless War — cheer just as loudly when that same mindset is applied at home to domestic trouble-makers. The supreme threat has never been from foreign Terrorists, but rather from what was done by our own public- and private-sector authorities (and the mentality they successfully implanted) in their name. (3) Beyond the light it is shedding on how power is really exercised in the U.S., this UC-Davis episode underscores why I continue to view the Occupy movement as one of the most exciting, inspiring and important political developments in many years. What’s most striking about that UC-Davis video isn’t the depraved casualness of the officer’s dousing the protesters’ faces with a chemical agent; it’s how most of the protesters resolutely sat in place and refused to move even when that happened, while the crowd chanted support (this video, taken from a slightly different vantage point, vividly shows this, beginning at 4:15). We’ve repeatedly seen acts of similar courage spawned by the Occupy movement. It was the NYPD’s abusive pepper-spraying, followed by Mayor Bloomberg’s lawless destruction of the Zuccotti Park encampment, that prompted far more people than ever to participate in the next march across the Brooklyn Bridge. A tear gas attack on Occupy Oakland was followed by a general strike of 20,000 people. And this truly extraordinary, blunt and piercing open letter demanding the resignation of the heinous UC-Davis Chancellor Linda P.B. Katehi was written by a young, untenured Assistant Professor — Nathan Brown — who obviously decided that his principled beliefs outweigh his careerist ambitions. This is the most important effect of the Occupy movement: acts of defiance, courage and conscience are contagious. Just as the Arab Spring clearly played some significant role in spawning, sustaining and growing the American Occupy movement, so too have the Occupy protesters emboldened one another and their fellow citizens. The protest movement is driving the proliferation of new forms of activism, citizen passion and courage, and — most important of all — a sense of possibility. For the first time in a long time, the use of force and other forms of state intimidation are not achieving their intended outcome of deterring meaningful (i.e., unsanctioned and unwanted) citizen activism, but are, instead, spurring it even more. The state reactions to these protests are both highlighting pervasive abuses of power and generating the antidote: citizen resolve to no longer accept and tolerate it. This is why I hope to see the Occupy movement — even if it adopts specific demands — remain an outsider force rather than reduce itself into garden-variety partisan electioneering: in its current form, it is demanding and re-establishing the indispensable right of dissent, defiance of unjust authority, and sustained protest. Alex Steffen points to an interesting follow up at UC Davis, with a large contingent of silent protesters simply filming the responsible Chancellor as she crosses campus. And finally another one from Salon, this one noting that the military government in Egypt is cracking down rather heavily on the tahrir Square protesters who are still hoping to install a democracy in the country - As Egyptians Return to Tahrir Square, the Obama Administration Sides with the Military. In the nine months since Hosni Mubarak stepped aside, the Egyptian military has monopolized political decision-making. The SCAF has broken its promise to lift or modify the Emergency Laws, which have been in place since 1981 and give the state sweeping powers to detain citizens and restrict free speech, even though repeal of the laws was a central demand of the revolutionaries in Tahrir Square. One of the more egregious incidents was the death of 27 Coptic Christian demonstrators at the hands of what many suspect to be military personnel on Oct. 9 at the Maspiro State Television building in downtown Cairo. The military blames the demonstrators themselves for the violence. “Instead of identifying which members of the military were driving the military vehicles that crushed Coptic protesters, the military prosecutor is going after the activists who organized the march,” reported Sarah Whitson, the Middle East North Africa director of Human Rights Watch. The U.S. government shrugs off these abuses, attributing them to the SCAF’s inexperience. At a Nov. 3 press conference in Washington, U.S. Ambassador for Middle East Transition William Taylor asserted that military abuse can be attributed to the fact that the military is unaccustomed to governing and may be overwhelmed. “[Governing] is not what the Egyptian military is trained to do,” explained Taylor. Nadeem Mansour, the executive director of the Egyptian Association for Economic and Social Rights, a Cairo-based NGO, called Taylor’s assertion baseless. “You don’t need to torture civilians because you are overwhelmed. They [the SCAF] are a repressive force by nature and they require an authoritarian environment. After all, they were all appointed by Mubarak, served him well, and still represent this mind-set,” he told Salon. Bloomberg reports that origin is looking to expand its APLNG coal seam gas export project - Origin Seeking at Least One More Buyer to Expand LNG Project. Origin Energy Ltd., ConocoPhillips’s partner in a $20 billion Australian liquefied natural gas venture, said it aims to sell more than half the fuel from the project’s second phase before committing to an expansion. The project in Queensland state will likely need to sell 50 percent to 75 percent of the LNG from the second stage before the partners make an investment decision, Karen Moses, executive director of finance and strategy at Sydney-based Origin, said today in a telephone interview, adding that no final decision had been made. Origin and Conoco, the third-largest U.S. oil company, are among energy companies in Australia planning more than A$200 billion ($200 billion) of LNG projects to tap rising Asian demand for the cleaner-burning alternative to coal. The venture yesterday agreed to supply Japan’s Kansai Electric Power Co. with 1 million metric tons of LNG a year, or almost 25 percent of the capacity from the second unit, or train. Origin and Conoco are pursuing “at least one more” buyer for the coal seam gas-to-LNG venture, with customer interest increasing since the nuclear crisis in Japan caused by the March 11 earthquake and tsunami, she said. The partners approved the first stage of their Australia Pacific LNG development in July, targeting first exports in mid-2015. The Climate Spectator has another article on how renewable energy can bring power prices down - Why solar parity scares big utilities. Thursday January 29, 2009, was a big money day for Victoria’s brown coal generators. After a night of uncomfortably warm temperatures, and a dawn reading of 32°C, Victoria’s residents turned to their air-con and pedestal fans in near record numbers. By 9am, demand had spiked so high that electricity prices had soared to $10,000 a megawatt hour as utilities switched on every last generator they could find to meet demand. These wholesale prices are normally between $35-$50/MWh. During that day, which reached a peak of 44.3°C in Melbourne in mid afternoon, the wholesale electricity price never fell below $1,000/MWh. For nearly four hours, it hovered around the $10,000/MWh price. The way the National Electricity Market works means that every generator switched on at that time receives that price, even though it still only cost the brown coal generators around $4/MWh to shovel the coal into their power plants. Over an eight-hour period, the state’s generators would have pocketed an estimated $550 million in revenue, near one fifth of their total revenue for the year. It was, needless to say, an absolute jackpot for the generators. But while this was an extreme case, it was not an atypical event in the NEM. It is estimated that, on average, around one quarter of the revenue from electricity sales each year is generated from the prices gleaned from around 24-36 hours of peak production. The business models of the energy utilities depend on it. But now those models are under threat. What, for instance, would have happened that day to electricity prices had there been large amounts of solar deployed along the eastern seaboard available to meet demand? According to modeling conducted by the Melbourne Energy Institute at the University of Melbourne, 5 gigawatts of solar PV would have been very effective in curbing peak demand. Prices would still have spiked, but not over $300/MWh, and for shorter periods. The total revenue for the day would have been just over $340 million – half of what it would otherwise have been. This is what is known as the merit order effect: the effect technologies with a short-run marginal cost – i.e. with fuel that costs next to nothing, such as solar, wind – have on the market when they deliver electrons en masse to the grid. The overwhelming evidence from Australia and overseas is that they bring the wholesale cost of energy down, sometimes so much that the reduction in prices is greater than the cost of the subsidies that got them built in the first place. And established utilities with higher-cost fuel, such as coal and gas, don’t like it one bit, and are suddenly realising the extent of the threat to their business. Normally, the overnight load in Victoria stands at around 5.5GW, not enough to even meet the output of all of the state’s coal-fired generators. Wholesale prices barely meet the cost of production. At 8.5GW of demand, an average high-load weekday, peaking gas generators are required and the wholesale price jumps to around $70/MWh. The coal-fired generators make money. But would this still be the case if 1.5GW of solar was available? The Melbourne Energy Institute says not; it would mean that gas-fired utilities normally brought into the grid would not be required and the wholesale price would remain at modest levels. This might explain why state governments, in Victoria and NSW in particular, are happy to delay the rollout of renewable energy at a large scale. As noted here before, Victoria’s decision to defer an increase in its state-based renewable energy target was motivated by the potential impact of the merit order effect on the state’s coal-fired generators. Right now, the deployment in both wind and rooftop solar is at a virtual standstill because of policy uncertainty. That suits the established generators just fine. Mike Sandiford, the director of the Energy Research Institute at the University of Melbourne, says that in the case of solar, this is simply delaying the inevitable. Grid parity – and the deployment of solar at a scale that the modeling contemplates – is coming whether the governments and the utilities like it or not, and it’s time policy makers faced up to the issues that it presents. “We can either hide from grid parity or we can embrace the challenges,” Professor Sandiford said. “All we ever hear is that it is expensive, can’t deliver, or is not worth investing. We rarely hear of the opportunities.” The modeling of the 5GW solar scenario was extended to cover the entire 2009 and 2010 years. It found merit order savings of $1 billion in the first year and $600 million in the second, and avoided transmission and distributed investment. As those figures show, it’s not just the generators that are impacted by this, it is the network operators as well. NEM data shows that while peak demand is growing, mean demand has plateaued and is now falling, possibly as a result of rising electricity prices, more solar PV, the merit order effect, or even the benefit of the pink batt program. This divergence has meant that more infrastructure is being built to meet peak demand and is being used less during the day. And despite spending billions on network upgrades, and contributing well over half of the increased retail prices, the industry is losing productivity at a rate of 1 per cent a year. In most industries, this would be untenable. A dramatic increase in distributed energy such as solar would force the network operators to revisit the means to make money. MNN reports Ulan Bator is considering an unconventional approach to cooling in summer - Mongolian city to be cooled by giant ice cube. In one of the grandest geoengineering projects in the world to date, the Mongolian capital city Ulan Bator is preparing to keep cool this summer by freezing and storing a gigantic block of ice, reports the Guardian. The ambitious project, which is being spearheaded by Mongolian engineering firm ECOS & EMI, will use the giant ice cube to reduce energy demand from air conditioners during the hot summer months, as well as to reinforce irrigation supplies. Citizens of Ulan Bator will also be able to tap the ice for their drinking water. The plan is a practical one for Ulan Bator because of the city's unusually bipolar climate, which can be unbearably hot and dry during a few summer months but bitterly cold throughout the winter. In fact, Ulan Bator is the coldest national capital in the world. Ice can therefore be farmed during colder months and made to last through the summer. In order to generate the giant ice cube, engineers have looked to nature for inspiration. The idea will be to artificially create "naleds"-- sheet-like slabs of layered ice, common in subarctic climates, that form from successive flows of freezing, pressurized ground water. Naled ice is far thicker than regular ice formation on lakes, since new layers continue to form so long as there is enough water pressure to penetrate the surface. In fact, naleds can be so thick that they have been used as drilling platforms, and even to build river crossings for tanks. Officials will manipulate the naled-forming process by drilling bore holes in the ice that forms on the nearby Tuul river. As the water discharges across the surface of the ice, it will freeze in successive layers-- much like stacking ice rinks on top of ice rinks. Although it may sound like an extreme solution to global warming, Mongolian authorities think that the technology could soon be utilized to combat rising temperatures in cities around the world. Giant ice cubes could even be used to create cool microclimates or ice-themed amusement parks that help sweaty citizens beat the heat in the summer. Why Is China Building These Gigantic Structures In the Middle of the Desert ? Gizmodo has an article which got a bit of attention this week showing various aerial photos of the Chinese desert with massive unexplained structures. Some of them are attributed to nuclear test ranges and HAARP style military programs - but the image below looks a lot like a solar thermal power tower to me - Why Is China Building These Gigantic Structures In the Middle of the Desert. This is crazy. New photos have appeared in Google Maps showing unidentified titanic structures in the middle of the Chinese desert. The first one is an intricate network of what appears to be huge metallic stripes. Is this a military experiment? They seem to be wide lines drawn with some white material. Or maybe the dust have been dug by machinery. It's located in Dunhuang, Jiuquan, Gansu, north of the Shule River, which crosses the Tibetan Plateau to the west into the Kumtag Desert. It covers an area approximately one mile long by more than 3,000 feet wide. The tracks are perfectly executed, and they seem to be designed to be seen from orbit. Perhaps it's some kind of targeting or calibrating grid for Chinese spy satellites? Maybe it's a QR code for aliens? Nobody really knows. Ecoseed has a report on a large offshore wind farm planned for South Korea - South Korea to build $9 billion offshore wind farm by 2019. South Korea's Korea Electric Power Corporation will build a $9 billion, 2.5-gigawatt offshore wind farm off the southwest coast of the Korean peninsula by 2019, the Ministry of Knowledge Economy said in a statement. According to the ministry, the 51-percent government-owned Kepco will be buying wind turbines from eight local suppliers including Doosan Heavy Industries and Construction, Daewoo Shipbuilding and Marine Engineering, and Hyundai Heavy Industries. The wind farm project will be built in three phases, beginning with a $355-million demonstration project by 2014 which will consist of turbines having the capacity of between 3 and 7 megawatts. The second phase 400-MW demonstration project will have an investment of $1.42 billion by 2016. To complete the third phase is a $7.26-billion investment to build a 2-GW wind farm by 2019. While I haven't been paying much attention to the "Occupy" protests this bit of video from UC Davis is an interesting example of the "Participatory Panopticon" at work - how many people are recording this thing ! (via Alex Steffen.). RAdio National has a segment featuring Matthew Wright of Beyond Zero Emissions, who is accusing Worley Parsons of suppressing a report into greenhouse emissions from coal seam gas - Radio National: Coal Seam Gas Report 'Suppressed'. Fran Kelly- It’s been hailed as the low carbon fuel to help us transition to a clean energy future, but in recent months, some have started to question the climate credentials of the so called ‘unconventional gas’; coal seam gas and shale gas. Greens leader, Bob Brown says ‘the jury is out’ on whether gas will actually deliver greenhouse gas emission savings. So back in June, a renewable energy think tank called Beyond Zero Emissions, tried to get to the bottom of the matter, commissioning a report designed to compare whole of life cycle emissions from coal seam gas and shale gas, with other energy sources - resources including shale, coal, and renewables. Now Beyond Zero Emissions claims that consultants Worley Parsons are refusing to hand over that report, as our environment editor Gregg Borschmann reports, Worley Parsons rejects that claim. Gregg Borschmann- In the Australian policy response to climate change, it’s hard to overestimate the importance of gas. Gas is going to helpcut Australia’s greenhouse emissions. Martin Ferguson- This is a major long-term benefit to Australia. Gas is clean energy, it is about the transition to a lower emissions economy. Gregg Borschmann - That was Federal Resources Minister Martin Ferguson speaking on Breakfast two weeks ago. But as the new coal seam gas industry booms, and shale gas looms, what if these unconventional sources of gas, turn out to be little better then digging up and burning coal. Matthew Wright- The upper management or the board has actually stopped us from receiving the report and we believe that’s on the basis that the report has some pretty explosive detail. Gregg Borschmann - That was Matthew Wright, Executive Director of the climate research and advocacy group Beyond Zero Emissions. The report he’s talking about was commissioned in June this year. It was contracted to be a major new report on the climate credentials of both conventional gas and unconventional sources like coal seam and shale gas. These were to be compared with other forms of energy, from coal to renewables. And most significantly it was to carry the brand of Worley Parsons, one of the world’s biggest engineering companies consulting to the resources sector. Curiously, earlier this year, Worley Parsons had completed a similar report for APPEA, The Australian Petroleum Production and Exploration Association. So why two reports? Matthew Wright- The first one was basically being misrepresented, so we went to Worley and said ‘(you’ll) will you be able to do the same sort of thing for us’, and we even increased the scope beyond that to capture a whole lot of other emissions and other displacement scenarios that APPEA has obviously, deliberately, left out of their scope. The NYT reports that the boom in rare earth prices seems to be over now - Prices of Rare Earth Metals Declining Sharply. After nearly three years of soaring prices for rare earth metals, with the cost per ton of some of these elements rising nearly thirtyfold, the market is rapidly coming back down. International prices for some light rare earths, like cerium and lanthanum, used in industries like the polishing of flat-screen televisions and oil refining, respectively, have fallen by two-thirds since August and are still dropping. Prices have declined almost as quickly for highly magnetic rare earths, like neodymium, needed for products like smartphones, computers and large wind turbines. Big companies in the United States, Europe and Japan have been moving operations to China, drawing down inventories, switching to alternative materials or even curtailing production to avoid paying extremely high prices that prevailed outside China over the summer, executives said at an annual conference in Hong Kong on Wednesday. As demand for rare earths has wilted outside China, speculators have been dumping inventories, feeding the downward plunge. Cerium peaked at $170 per kilogram, or $77 a pound, in August but now sells for $45 to $60 per kilogram. That is still far above its price of $6 a pound three years ago, before China, the world’s dominant producer, began sharply reducing exports by cutting its export quotas. “We all learned a hard lesson in July and August, how high these prices can go before customers begin yelling,” said Mark Smith, the chief executive and president of Molycorp, the only U.S. producer of rare earths. He added that rare earth mining outside China remained very profitable even with the decline in prices, which has brought the market back down to its level last spring. The sharp decline in demand and prices outside China could yet create another shortage next year, said Constantine Karayannopoulos, the chief executive of Neo Material Technologies, a Canadian company that has its factories in China. That is because Chinese exporters are very unlikely to use all of their export quotas this year, and the Chinese Commerce Ministry has historically penalized exporters that do not use all of their quotas by giving them smaller quotas the next year. China mines 94 percent of the rare earth metals in the world. Through 2008, it supplied almost all of the rest of the global annual demand of 50,000 to 55,000 tons. But it cut export quotas to a little more than 30,000 tons last year and again this year, and imposed steep export taxes, producing a shortage outside China. 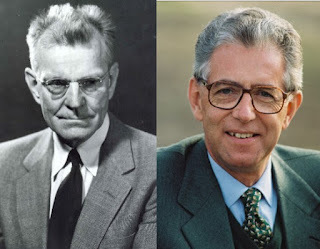 Ugo at Cassandra's Legacy has a post contrasting the old style scientist / engineer technocrats like M King Hubbert with the modern version - neoliberal economists like new Italian leader Mario Monti - Technocrats. Marion King Hubbert had foreseen many things correctly in his career, mainly about oil production. But he had also joined a group called the "technocrats" who proposed that technical experts should run governments. Maybe he was right also in this prediction, as the recent events in Italy may indicate. Professor Mario Monti has been appointed by the President of the Republic as the new head of the Italian Government, replacing the democratically elected, but disastrous, Silvio Berlusconi. I am not sure of whether Mr. Monti likes to be defined as a "technocrat," but the term fits his present job very well. Is this the start of a new trend? It is too early to say but, who knows? After 11 years and $39 billion of investment, Exxon Mobil Corp., Royal Dutch Shell Plc (RDSA) and their partners have yet to sell a drop of oil from what was touted as the world’s biggest discovery in four decades. Centered on a man-made island 70 kilometers (44 miles) from Kazakhstan’s coast, the Kashagan project is just months away from completion, $15 billion over budget and 8 years behind schedule. As the milestone of first oil nears, the Kazakh government is pressuring the group for a commitment on an even- bigger second phase, a project the oil companies are undecided on and one analyst says may not make money. "The biggest worry is whether the project can ever be profitable given the huge cost escalation and start-up delays,” said Julian Lee, a senior analyst for the Centre for Global Energy Studies in London. It may be "impossible for investors to earn a return on any investment in a second phase before their contract for the field expires” in 2041. Kashagan, which may hold enough oil to supply the world for six months, has become a cautionary tale for oil companies worldwide as they spend an estimated $20 trillion through 2035 finding supplies in ever more difficult places. Expenses mounted as engineers underestimated the complexity of drilling under a region of the Caspian Sea that’s frozen almost half the year. The government accused the partners, which are allowed to recoup spending before sharing the oil, of inflating costs. Nursultan Nazarbayev, Kazakhstan’s leader-for-life, toured Kashagan in September and declared it a "colossal” work defining his 20-year rule since the Soviet Union’s collapse, which included building a new capital city in the middle of the country’s steppe. When the oil project starts production it will be a milestone for the Central Asian republic of 16.5 million that’s four times the size of Texas. Kashagan may initially produce 370,000 barrels a day, which will rise to 450,000 barrels a day by 2016, Kazakhstan’s Mynbayev said Oct. 4. The SmartPlanet blog has a post on low cost battery technology from a company called Acquion which uses cheap and plentiful materials - Batteries Made Of Salt Water last 10x Longer. Jay Whitacre wants to change the world with batteries - and the recipe for change, he believes, is in everyday materials like salt and water. Although he can geek out on complicated lectures on battery technology, last week at The Compass Summit in Los Angeles, Whitacre told me in much more simple terms about how his battery technology works. Using sodium ions instead of lithium, Whitacre’s batteries have been designed to store energy for the grid. After spending two years figuring out the ideal chemistry for non-toxic batteries, Carnegie Mellon engineering professor Whitacre spun his technology into a startup company called Aquion Energy in January 2010. Pre-production of the sodium-ion batteries is expected this fall, and the production plant is on track to begin in 2013. In September, Aquion announced a round of $30 million in funding from Foundation Capital, Kleiner Perkins Caufield & Byer, Advanced Technology Ventures, and Triple Point Capital, to build its first factory. The batteries are designed for stationary applications in residential and buildings. The plan is to start with smaller installations and move into major ones. Aquion Energy’s technology has received some recognition: Last week, the company won a United Nations award for energy at The World Technology Summit. Even though lithium is a common technology used in iPhones or computers, it’s expensive, it needs organic solvents, and has high purity requirements. The other alternative is lead acid batteries, which are known to release toxic lead. With that in mind, Pittsburgh-based Aquion Energy is making batteries out of non-toxic materials. The anode is made of carbon, while the cathode is made from manganese oxide. The battery is made of individual units that are put together into 8 batteries of 15V modules. "Electrical power is the only commodity sold in the world right now without any kind of warehousing. When you plug something into the wall, you immediately pull energy from a generation asset. It’s not stored anywhere. We store data, water, and gas. We do not store electricity. Historically, it’s just been too expensive," Whitacre said. "For the first time, renewable power sources are competitive with traditional, especially in developing countries," Whitacre said. Lead acid batteries aren’t as good as the manufacture promised. Aquion’s batteries have a much longer life. "We believe we can last 5 to 10 times longer than lead acid at the same price point," he said. To design batteries that would be competitive, Whitacre found common, cheap materials to use: carbon, manganese, water, and different kinds of cheap plastics. For instance, one of the key ingredients is manganese, which is the cheapest metal oxide on the market. And it’s possible to reconfigure carbon, so it can be taken from corn syrup or other forms of carbon. "We have been very conscious of manufacturing. It’s about taking cheap materials and being able to reconfigure them," Whitacre said, explaining why the company plans on using food processing, pharmaceutical processing, and other kinds of techniques that aren’t usually found in high-tech manufacturing plants. Giles Parkinson at the Climate Spectator reports that Chinese solar company Suntech thinks Australia is headed for a solar power boom - Suntech calls an Australian solar boom. Suntech, the world’s largest solar manufacturing company, has produced stunning forecasts for the solar PV industry in Australia – saying it could supply 5 per cent of the nation’s power demand by the end of this decade, reaching the target three decades ahead of the federal government’s most recent forecast. Stefan Jarnason, the technical director of Suntech Australia, says solar PV capacity in Australia could reach 10 gigawatts by 2020, when it would be growing at a phenomenal 2GW a year. He bases these forecasts on rapidly declining costs, which mean electricity from rooftop PV that is already cheaper than coal-fired energy delivered by energy retailers in some parts of the country, will reach parity for commercial users around 2015, and parity for utility-scale developments towards the end of the decade. It's just a forecast, but it represents a growing realisation within and without the industry that in a very few years the rollout of solar PV will be dictated less by the scale of financial incentives – because it might not need much – but by the scale of regulatory protection for the current energy suppliers, because they might need all the help they can get. Jarnason predicts installation of rooftop PV will slump sharply to around 250MW in 2012 because of the dramatic changes in government incentives over the last six to 12 months, but will grow at 20 per cent per year as more consumers use it as a hedge against rising electricity prices. Again, this will depend more on the removal of regulatory barriers than on government financial support. He predicts commercial-scale solar PV will be around 40MW in 2012 and grow at 40 per cent a year, while utility-scale solar will grow at 20-60MW per year, before experiencing massive growth from around 2018, as solar costs come down, and hidden subsidies are removed from fossil fuels. “Until the government is able to remove hidden subsidies, growth in utility-scale will remain slow – when we hit grid parity there will be a boom," he told a seminar on "The Future of Solar," hosted by the Grattan Institute and the University of Melbourne last night. By the end of the decade, he says, the combination of solar PV and solar thermal with storage will be able to deliver base-load power. Such a scenario would appear to be a significant threat to the energy incumbents, particularly in the coal and gas industries, because it would reduce opportunities for new deployment and eat into their earnings because of the impact of solar and other short run marginal cost technologies in the so-called merit order effect (more on that tomorrow). It would also come as a shock to the government, which forecasts just 5 per cent solar by 2050 in scenarios painted in its Clean Energy Future package. The long-awaited Energy White Paper, which will be delivered in the next month or so and will become the blueprint of the country’s energy planning over the next decade, will also be unlikely to have such a bullish forecast, seeing that none of the 23-person panel advising the government is a specialist in solar technology. Indeed, Jarnason says the main impediments to the industry are not cost but regulatory barriers, with politicians seemingly unaware of the technology’s potential. “Unfortunately, politicians view solar PV, and probably to an extent all renewable energy, as a political exercise than an energy generation exercise," he said. And the small numbers of incumbent generators, retailers and network operators are highly influential and also keen to maintain regulatory barriers. “They’d rather not have to change," Jarnason said. "Solar PV is a form of distributed energy, so (the utilities) need to rethink how to generate supply to get you and I to pay for their energy." This echoes the thoughts from the CEO of US utility NRG Energy. Suntech’s forecasts may come as little consolation to the likes of SilexSolar, which announced on Tuesday that it would suspend manufacturing at its Homebush plant in Australia, blaming a trifecta of cheap Chinese imports, the high Australian dollar, and the policy changes on solar PV, particularly in NSW where the market has fallen to virtually zero. Ironically, the company's decision to shut down came just a week after the carbon pricing legislation was finally passed by the Senate, and on the same day as a Chinese-based solar PV parts manufacturer announced a $6 million float on Sydney’s new venture capital market, the SIM-VSE. Suntech’s Jarnason says that while the modules needed to meet his bullish solar forecasts would almost certainly come from China, more than half the economic value of the solar PV build-out would be for building, operating and maintaining the plants. He says solar PV generates more jobs per gigawatt hour than other technologies, and Australia still has the opportunity to export PV technology and know-how. He says Suntech is spending $40 million a year on research and development, much of it in Australia where it supports programs at the world-leading UNSW and elsewhere. Suntech’s chief executive, chief operating officer and chief technology officer are all Australian citizens.